I love animation. Most forms of art are entirely subjective, but animation isn’t really one of those things. Sure, you can hate the stories, or the characters, or the art style. But to hate the animation itself? That’s just silly. The effort required to animate something, and animate it well, is phenomenal. That’s why it’s a dying art. Or if you ask me, a dead art, buried in a shallow grave round the back of the Pixar car park. 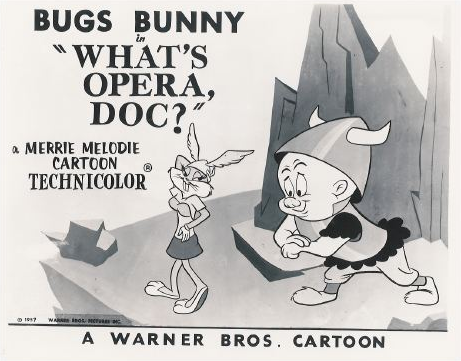 I love cartoons, and while I’m not stuck in the past, one of my all-time favourites is the 1957 Bugs Bunny short What’s Opera Doc? Ironically, the lobby card is monochrome.